Old Ray has survived being shot 3 times and although he can never go back to the wild, he starts a new life today as an animal ambassador at the Indianapolis Zoo. Dinner time! Old Ray, now known as simply "Ray," stands at attention as he is fed his meal of fish at the Indianapolis Zoo. Old Ray is well and apparently happy in his new digs at the Indianoplis Zoo. According to zoo officials; "Your boy (Old Ray) is doing great! He is getting along with the female sea lions, harbor seals and grey seal. What a great sea lion he is." Old Ray is doing fine at the Indianapolis Zoo and is checking out his temporary digs. It's standard for new animals to be held in a private space for a while to get adjusted to unfamiliar surroundings and caretakers. In a few weeks, "Ray" as he is now being referred to, will be transferred to the zoo's sea lion and seal exhibit next to the Ocean Building. In case you were wondering how this big guy got his original name - it goes back to Ray Retez, the owner of much of the land in Moss Landing, CA where Old Ray stranded the first time. OLD RAY GOES TO A NEW HOME! This morning (at 3:30am!) Old Ray, the sea lion that has been shot three times and cannot be released back to the wild, was flown by FedEx to his new home at Indianapolis Zoo. Just before noon PT today we heard that Old Ray had arrived safely at Indianapolis Zoo and that he's swimming in their holding area and barking - a good sign! One last hug! Sea lions Old Ray & Mr. Peppy pictured together relaxing by their pool at The Marine Mammal Center in the last week before Old Ray is flown to his new home at Indianapolis Zoo. We'll update update you on his progress and let you know when he goes on display to the public. Great news to announce today - Old Ray will soon have a new home! He'll be traveling to the Indianapolis Zoo where he'll receive the right amount of care and attention he needs to thrive wonderfully. Today, our staff continued training him in preparation for that trip and for his new environment. At the same time, they took advantage of the time to weigh him. He's gained 92 lb since we first saw him in Nov. last year and now weighs 267 lb. Veterinarians perform cataract surgery on Old Ray to help him see better out of his left eye. On June 8, "Old Ray's" bad right eye and the cataract in his left eye were surgically removed under general anesthesia with the assistance of a team of at least eight veterinarians! With the cataract removed, he'll have better vision out of that eye which is great news for an animal that's already been through a lot! Geno DeRango from The Marine Mammal Center does target training with Old Ray. Staff had a great interactive day with Old Ray as they began to get him used to voice and visual commands in preparation for his new life at a zoo or an aquarium. A new exercise that he completed today was the ability to walk through an open-ended metal carrier, a practice that will become more common for him once he needs to be transported. Old Ray is blind in one eye as a result of a gunshot. Sadly, Old Ray was found at Moss Landing Harbor on March 16 with injuries to his right eye and mouth. At the hospital, veterinarians discovered that the injury to his eye was as a result of yet another gunshot wound he sustained and that he had no vision in that eye. In addition, he developed a lens opacity which leaves him with limited vision in his left eye. You may recall that when we first rescued him in November last year, veterinarians discovered evidence of previous gunshot wounds, so this animal has definitely been subjected to human cruelty. Outside of his wounds, Old Ray is in good body condition and eating well - despite needing a little guidance to find the fish that's put before him at meal time. 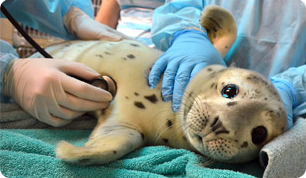 He will not be able to fend for himself in the wild, so the Center is working with the National Marine Fisheries Service (NMFS) to find a permanent home for him where he'll be safe and have the proper care he needs. You can see Old Ray at the hospital - he currently resides in pen A2. Visit him today! Old Ray is back in the ocean! Watch this video of his release at Rodeo Beach, just steps away from The Marine Mammal Center. A California sea lion managed to survive, despite being attacked by what appears to be two shooters. "Old Ray" was found at Moss Landing Harbor on November 15, 2011. Clearly ill, his water-drinking behavior suggested he had leptospirosis, a bacterial infection of the kidneys. Often deadly if not treated, with a round of medication and some fattening up, we hoped he’d be good as new. However, during his check up we found something disturbing. Radiographs of Old Ray’s head and torso showed that the burly 175-lb pinniped had suffered not one, but two previous gunshot attacks, identifiable because bullets and shotgun pellets were still lodged in his skull and body. X-ray from 2011 shows previous metal fragments scattered throughout Old Ray's head. Sadly, a fair number of sea lions are rescued by the Center with signs of previous gunshot wounds that have since healed over. In 2011, the Center admitted 10 patients with gunshot wounds - including a large male sea lion named Silent Knight who had been shot in the face and is now permanently blind. he now lives at the San Francisco Zoo with another blind sea lion named Henry. It is illegal to harm or harass a marine mammal under the 1972 marine mammal protection act. Violators can be prosecuted and fines and even jail time imposed for convictions. Jax Got a Second Chance!